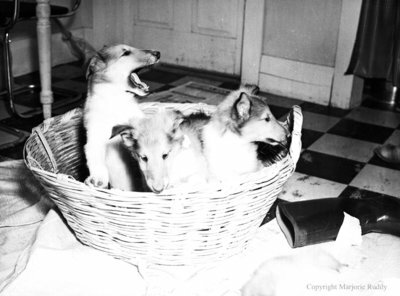 A black and white large format negative of Harold D. Rowley's collie puppies sitting in a wicker basket. Ruddy, Marjorie ; Rowley, Harold D.
Rowley Collies, February 28, 1950, Marjorie Ruddy. Whitby Archives A2013_040_321.